Today is the Day 4 of our January Release Reveals and we have one more adorable set to share! 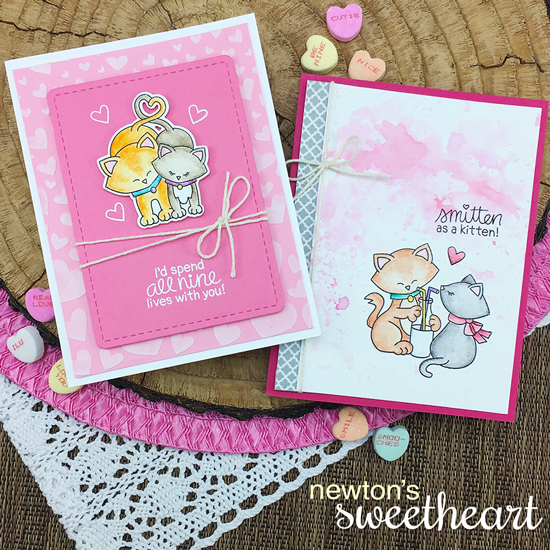 Today we are revealing our newest Newton set where newton finds a girl kitty just in time for Valentine's Day in our new Newton's Sweetheart Stamp Set and Coordinating Die Set. We are giving the Newton's Sweetheart stamp set away one lucky winner so make sure you read all the way to the bottom of this post to see how to win! 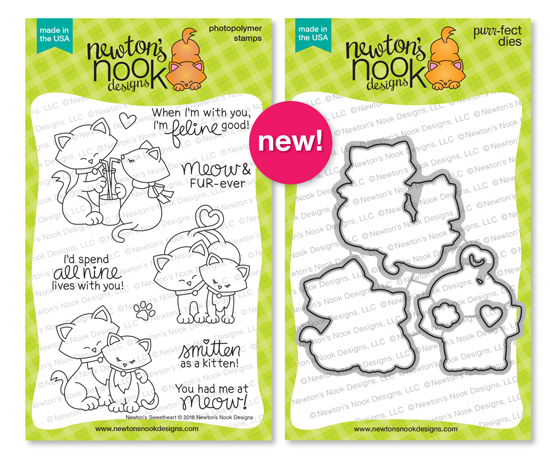 Our favorite feline, Newton, has found love in this 4x6 stamp set. This set features Newton with his adorable kitty sweetheart! These sweet kitty couples will be so fun to color and add onto Valentine's greetings, Anniversary cards and more! The sentiments included are perfect for cat lovers too! You are going to LOVE these cute kitty couples! Check out adorable inspiration from our Design Team below! 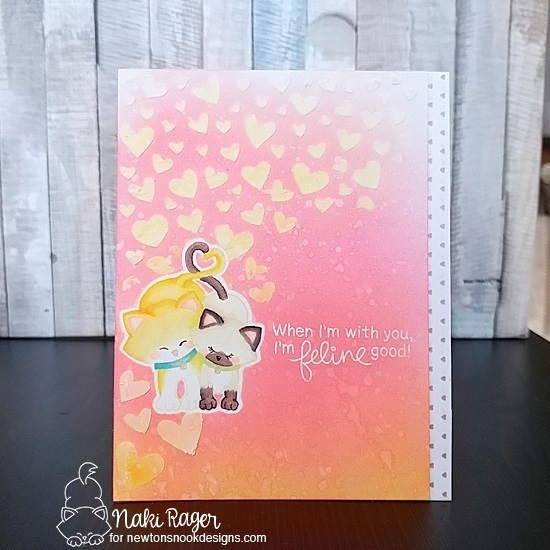 Holly created this beautiful kitty Valentine using the cute kitty couple from the new Newton's Sweetheart Stamp Set. She added them in front of a gorgeous sparkly heart background that she created with the new Tumbling Hearts Stencil. 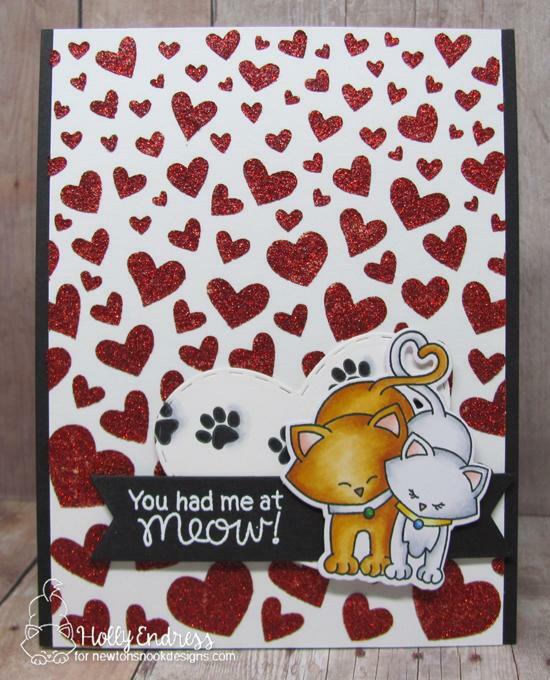 She also used the heart die cut from our Darling Hearts Die Set behind the kitties! Aren't the kitties sharing a bottle of milk on this card by Samantha so adorable!? It's so fun how she featured the kitties against a white card base and added a beautiful rainbow going up the side! This card is so happy and cheerful it's sure to make the recipient smile! 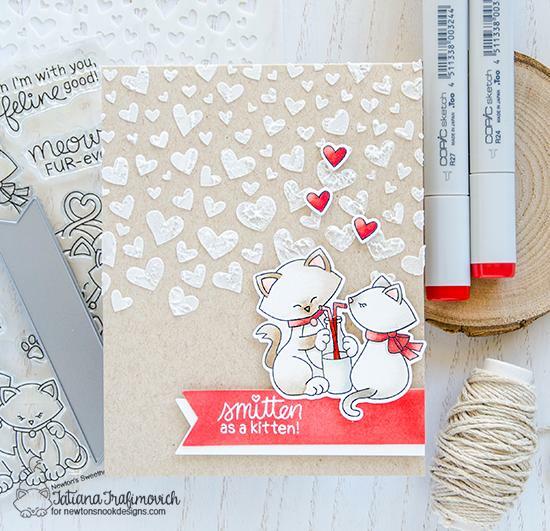 The sweet kitty couple on this card by Larissa will leave you "smitten!" She colored those kitties with cute stripes and used our Frames & Flags Die Set to cut out the black scallop edged frame. She also used our Tumbling Hearts Stencil to add in some light blue hearts behind the kitties. Tatiana used those smitten kitties sharing a milk from the new Newton's Sweetheart stamp set along with shades of red and kraft for this adorable card. She also used our Tumbling Hearts Stencil with white embossing paste to create that lovely background! 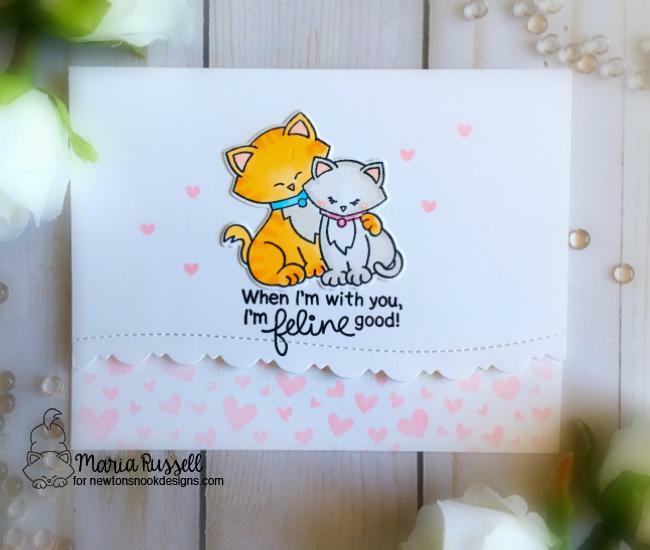 The kitty couple on this card by Maria look so cozy together! She added them to a clean and simple card with a fun scalloped edge and a border along the bottom. She also created that heart patterned edge using our new Tumbling Hearts Stencil! This beautiful card by Naki features the kitty couple colored in soft no-line coloring! She layered them over a lovely pink and orange background that she created using our Tumbling Hearts Stencil with embossing paste and distress inks over the top! Juliana created this darling shaker card using that cute kitty couple from our new Newton's Sweetheart Stamp Set. They are so cute colored in shades of black in front of the pale pink heart background that she created with the Tumbling Hearts Stencil. She also used our Frames & Flags Die Set to create the frame for the shaker! Jennifer is playing matchmaker on her card today. She colored the boy kitty to look like our Newton and the girl kitty to look like her kitty, Kate! The look so adorable together in front of that cardboard heart (cut out using the Darling Hearts Die Set). 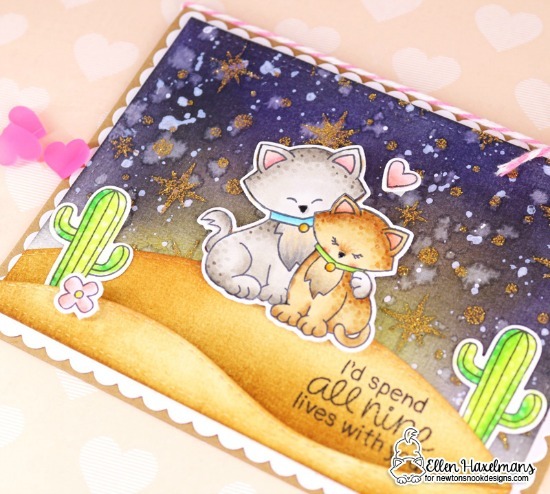 Ellen created an adorable scene using the snuggly kitty friends from the new Newtons Sweetheart along with some cacti from the Newton Rides West Stamp Set. To create scene she used our Land Borders Die Set for the hills and for the starry sky she used our Starfield Stencil! Would you like to win the “Newton's Sweetheart” Stamp Set? Comment on the NND blog and Design Team blogs (see list below)! The winner will be chosen at random from the collective reveal posts. Make sure to check out each of their blogs and comment for your chance to win. You will not know which blog has been chosen so the more you comment on the better your chances are of winning! You have until Thursday January 18th at 9pm EST to comment -- winners will be announced on the blog post on Friday, January 19th. Great release! Love this set! Another great stamp set. I never get enough of those kitties. So so cute! I love the punny sentiments. Love this sweet stamp set and all the fabulous cards...😊😊!! Your cards are so cute! Awwwwe! Newton's got a girlfriend! These new stamps are super cute! Another fabulous set and more great work from the DT! Oh, this stamp set is super cute! Purrfect for anniversaries, Valentine's, etc. Thanks for the amazing DT inspiration. yet!! Such cute images. Love your pretty cards! So sweet, I may get a crafty cavity! LOVE those entwined tails!! These kitties couldn't be more sweet, cute and purr-fect for the Valentine's Day cards and not only! Love the amazing coloring the DT made on the cute couples, amazing layouts and all the purr-rect little details! Another gorgeous release filled with fabulous products!!! No way to choose favorite!!! What a darling set! Love these images! Awww, how cute are these cuddling kitties?!! I really love all the clever sentiments in this set, and of course Newton looks dapper cuddling with his girlfriend. I like how you incorporated the stitched dies and new hearts stencil on your card too Jen! love this super cute stamp set! This has been an absolutely adorable release and hop. I don't know what set I love the most... but the heart stencil is on my wish list for sure. Oh my!!! I'm totally in love for this stamp set!!! It's definitely my fav of all this new release!!! What a really cute love set...such creative sentiments. Eeeeekkk these are adorable and what unique coloring on each bloggers card! Fantastic! Or should I say meow'astic! SWWEEET!! Love these cuties and the fun sentiments. The Design Team cards are so varied and fun! Love these kitties! Such a great release and can't wait to get my hands on it. This is such a sweet set! Love and cats; who could ask for anything more? And I love how each of the cats is colored so differently on each DT member's card. This set has a 1950's flare to me, especially the two cats sharing a soda! Love it!!! I really like this set! So cute! Newton's got a girlfriend and she is beautiful! Sweet set for Valentines! Sweet set of loving images. Beautiful DT cards. That’s the most adorable stamp set ! Newton in love is the pe4fect card for Valentines ! These cards are darling and the new release is fantastic!! I just love Newton...these are adorable. Cheers. The cards are adorable, as is the stamps set, of course ! SNEAK PEEKS of our January Release! !